Those are bog-standard PC board edge-connectors. When you design your module, simply include the matching "fingers" on the end of the PC board. They are typically gold-plated for reliabilty. I have a nixie clock with a very similar design and use components removed from cheapo DS3231 modules and have never had any issues. My design is almost identical in that I use SQW (although mine has a 10k pull-up on that line) in the same way... interrupt every second and then read the time from the module. I get accurate time, a few seconds over many months. Perhaps test your DS3231 with just an UNO as a sanity check. Repair / Re: Anyone willing to hold my hand to get me back on my feet with a car amp repair? Sounds like a Type 1 error - null hypothesis rejected for the wrong reason! My accountant is 75 and sharp as a razor. He refuses to retire... says he needs to do numbers to keep the brain circuits working. General Chat / Re: Who pays for Electronics companies like this? It's going to be a looong holiday weekend, it'll certainly feel like it anyway! AH! Yes. And I'm very impressed, reading past posts from a general search, and your connection. I'm ordering the VDS-1022 this afternoon. David Cutcher "Certified Evil Genius"
Thank goodness for IPA and Q-Tips. I buy IPA by the case, so I concur with the grit and grime sentiment. The scope looks great! 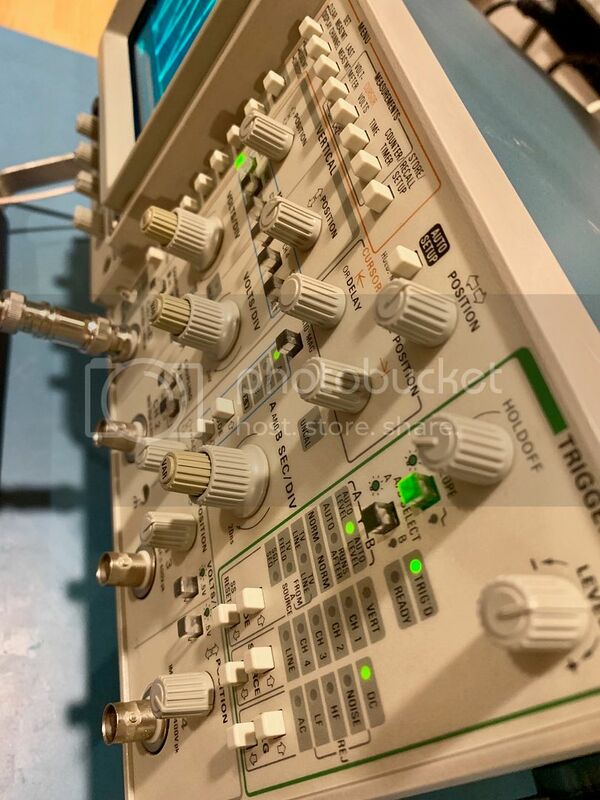 Unfortunately, the photos triggered a raging bout of NBR (Non-Buyers Remorse) for passing up the chance to buy either the TDS420A or the 2246 last night when we were sorting through gear. EEVblog Specific / Re: EEVblog #1201 - Nobel Laureate Electronics Hobbyist! What an amazingly nice guy! Repair / Re: Analog audio tape recorders - any experts here? Let's talk bias. There's an art to setting bias, and the physics behind it are complicated. I've worked on a couple big 2" tape 24-track machines in recording studios. Ampex 1967 Biasing in Magnetic Tape Recording is a good discussion. Optimum bias amplitude depends on tape formulation and speed, record head gap. It affects distortion, noise and freq. response. It's difficult because you can trade-off noise for distortion or high frequency response - all three parameters interact. Recording engineers can optimize bias on certain tracks, for high freq. response on the drum kit, or noise for vocals etc. So you will find all kinds of personal rules and preferences for setting bias. Pros will use an audio analyzer and check THD verses frequency to determine optimum bias, checking noise as well. With a DC bias, such as a permanent magnet like Sony uses on their cheap cassette products, you end up operating on 1/2 the B-H curve and the result is high distortion with low sensitivity. It's better than no bias at all, but you can still see a distorted sine-wave. For AC bias, basically you set bias amplitude to give maximum output (highest tape sensitivity) at 1kHz. This is not the best for low noise though and popular method is to apply slightly too much bias (overbias) to the tape. Too much bias will give you tape noise, a poor S/N ratio. Mag tape noise is hiss plus low frequency "bias rocks" as they are called in the recording industry. It's a bumping, crackling noise sounding like rocks being hit together. The "bias rocks method" is to record a low freq. sine wave 20-50Hz, and on playback use a HPF and listen only to the bias rocks and adjust bias for minimum noise. BTW you have some weird hyrarchy mindset, if a director comes and stands next to your desk and says nothing what should one do? Stand up in military pose and salute while clacking your heels/boots ? Sorry i should have elaborated...by "addressed" i mean he said "Hello [Name]" in a polite way. This looks perfect. Do you have experience with it?